Who pays attention to me? 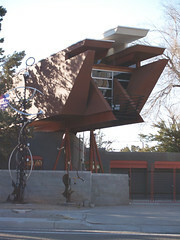 Bart Prince is an architect that I became aware of from some work he had done in California. It caught my eye. One day I day scrolling through the TiVo guide I noticed his name and recorded the show. I was about a home he had designed for his parents in Albuquerque, NM. 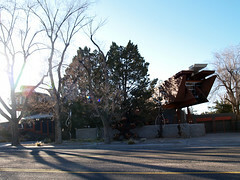 Because, like all his designs, it was rather distinctive, I was curious if my FIL, who lived in Albuquerque, was aware of this house. I asked my FIL and not only did he know of the house, but he happened to know Bart Prince. My FIL is a writer, among other things, and he had recently written a magazine article about Bart Prince, and has spent a fair amount of time interviewing him. A few weeks later a package arrived. It was a book about Bart Prince, signed to me from Bart Prince. It was a very thoughtful gift, showing that my FIL thought of me when I wasn’t directly interacting with him. I appreciated it. The next time I went to visit Albuquerque my FIL arranged to drop by and visit with Bart. I got to see his home and studio and listen to him talk about his current project in much different tones the soundbites so common on HGTV. It was an interesting afternoon and once again proved that my FIL actually stores little bits of information about me away in his head and tries to do things for me. We were just in Albuquerque for a couple of days this last unexpected trip, so he had us drive past Bart’s house so I could see the new structure that had been built next door on the second lot he owns. A house annex I guess. This is the new structure. 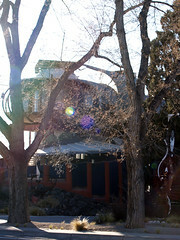 This is the home/studio that I visited the last time I was in ABQ. Sorry the photo was so bad, but I parked the car to take a photo of the new space. Here is a shot showing both. If we hadn’t been in the middle of running errands I would have gotten some decent shots of the sculptures out front. This is just in a standard neighborhood, built on two lots. It is not very large, although most of the homes around it are single story. Obviously it stands out, as the homes nearby are all traditional, but he has been there a long time so everyone is very used to it. Anyhow, I have people who are related to me by blood who pay less attention to comments I make.